At the end of August 2016, ten students of Britain’s prestigious Eton College visited Moscow and Saint Petersburg. We asked of the main organizers of the trip, David Wei, to tell us about his path to Christ. —David, tell us how you became a Christian. —From a very young age, I have always asked and tried to answer the big questions of life: What is the meaning of life? What happens when I die? Is there an afterlife? Is there a God? Who is God? My family was not religious and therefore I was never told the orthodox answers to these questions to memorize and believe in. Instead, I would try to answer these questions myself, but without any success because I had no idea who to ask or which books to read. I then went to Eton at age thirteen. It was there that I came across the academic subject, “Theology”. I realized there was a systematic way of answering these questions and Theology quickly became my favorite subject. In my second year at Eton, I was asked whether I wanted to become a confirmed member of the Anglican Church. I went on “Confirmation Exploration Day,” and decided afterwards that the pros outweighed the cons. I then took Confirmation classes, read books on the Christian faith, and realized that faith was not about what you do to go to Heaven, but what Jesus did for you (in his life, death and Resurrection). However, I still had many problems with Christian faith. The most significant one was that I was told you have to be a Christian to go to Heaven. This is a problem for me because not everyone in my family is a Christian. I then came across a Christian in my boarding house two years older than me. For an entire academic year, I spent around 2.5 hours with him every week reading through the Bible, talking about Christian experiences (miracles, answers to prayers) and most importantly praying. Looking back, I would say it was this period that I started to become a Christian. —As we know, Eton is an Anglican college. Do students attend the chapel there? —Chapel attendance is compulsory. The problem is that I don’t think you get much in chapel. There’s a Bible reading, but it’s from the King James Version, so no one really understands it, and the sound system is really bad so you can’t really hear it. The sermons that follow are mostly irrelevant; and I think a lot of the senior chaplains at the school have beliefs that are contrary to mine. There are certain things that are fundamental to the Christian faith and I think that a lot of the chaplains at school do not hold those beliefs at all, which is a problem. I think a lot of what is taught in chapel is not really Christian, but more about certain Christian values like loving your neighbor. But being a Christian isn’t about living a good life, but, as I see it, about a relationship between yourself and God, and therefore is based around Jesus’ life, death, and Resurrection. Every single person is given a Bible when we arrive to the school, so the school buys 260 Bibles every year. Most people file it away on their shelves and never read it again. Those who do read it are that very small number of Christians that I mentioned. We do study the Bible academically, for instance with a class on the Gospel of Mark, but that’s quite different from studying it from a confessional point of view. So no, we’re not encouraged to read the Bible except perhaps on a personal basis. I had a housemaster who realized I was interested in faith and therefore encouraged me to read the Bible because he cared about me as a person. —Do the Eton boys know about the Church Fathers, British saints, and their lives? —Students who are interested in the academic subject of theology may have, in their own time, looked into patristics (the Cappadocian Fathers). However, the early Church is not a subject that is taught in school, so any knowledge that Eton boys have would be through what they read in their free time. From a faith point of view, Eton College is an Anglican School and I do not think the Church Fathers or the British saints are featured very much. Although many boys (maybe two thirds of them) would identify as a Christian, I think that this identification is more for “cultural reasons” (such as celebrating Christmas/Easter) or even for “practical reasons” (getting married in Church). My own tradition is evangelical/charismatic Christianity. There is no emphasis on the Church Fathers or British saints and their lives at all because evangelical/charismatic Christians take their authority from the Bible. I think this is a big mistake. These Christians, I think, confuse between having the Bible as the “ultimate authority” and having the Bible as the “exclusive authority”. Even though these Christians would say that the Bible has ultimate authority, in which case it would make sense to talk about Christian saints and the Church Fathers, they don’t talk about Christian saints and Church Fathers, so this implies that these Christians believe the Bible to have “exclusive authority”. Furthermore, evangelical Christians believe that every Christian is a saint, and that a saint is not a special, holy person. Once you are a follower of Christ, God sees you through Christ’s lens and therefore you are already “purified” and therefore saintly. I am not sure I agree with this. I think, ultimately, that Jesus Christ is the ultimate source of authority in people’s lives. Evangelical Christians would say that Jesus needs to be revealed through various means, such as Church tradition, the Bible, experience, reason etc., and that there needs to be a trump card. I don’t think so. I don’t think the Christian life is as clear-cut as these Christians make out. One of my favorite verses in the Bible, 1 Corinthians 13:12, says, For now we see through a glass darkly, and then [after we die], face-to-face. —Does the education at Eton make people want to search for the higher meaning of life? —I think that everyone deep down, no matter where they are, no matter where they come from, what school they go to, what background they have, seeks this higher meaning, because I think that it’s God’s way of speaking to them—telling them that they should believe in God. Eton pursues excellence in everything it does, which is why people become prime ministers, why Prince William and Prince Harry go there, and so on. I like to think that I invited on this trip not only my friends but also some very impressive students who demonstrate the best of Eton’s talents, which I think is good in one sense, but from a point of view of faith is very bad, with too much focus on material success. For example, there are some people who are really good at economics or business, and therefore want to make a lot of money and think that making a lot of money is success and happiness and fulfillment. But then when people search for a deeper meaning or the meaning of life, it’s because they feel that their current meaning, such as the one they find at Eton, is insufficient. I’m not sure if I’ve expressed myself well, but basically the culture of competition and emphasis on self-worth and self-dignity at Eton could be seen as a very bad thing from a faith point of view, because it means you trust in yourself and not in God. If you don’t trust in God then you will have deep doubts as to what makes life meaningful. —How often do you discuss with Eton boys questions of faith? What is their reaction? —When I first became a Christian I used to discuss with other Etonians questions of faith very frequently (every day); it was almost on the top of my agenda. I then realized that sometimes I was being too forceful and that this had the opposite effect of what I wanted. I then started doing that less frequently. I have earned at Eton a reputation of “being a Christian”. I think this is partly through my character, trying to live out a Christian life, but I think this is more to do with what I say in public. I have given public speeches to my year group on how and why I became a Christian. This does mean that when other boys have questions regarding faith, whether they are genuine or whether they just want to argue with me, they always know that I am prepared to answer back. I have spoken with many people before so I feel rehearsed in any criticism that they have of Christian faith, to its supposed irrationality, dangerousness, tendency to fanaticism (ISIS, KKK, al-Qaeda). I have never yet persuaded someone to “become a Christian,” but often I make steps in the right direction, explaining something or giving a helpful analogy that solves a big problem that they have. I think trying to convince someone comes in many stages, and I hope I have helped many progress through the stages. —How do you see the future of Christianity in Britain? —From my limited understanding, I am pessimistic about Christian faith in Britain. I have a theory, a meta-narrative, that the more liberal/capitalist/wealthy a country becomes the more non-religious the country becomes. The simple explanation: Britain is a wealthy country and when people have wealth, material possessions become their god. (I think that God can be described as anything that is the “center of your life”) So for example, some people are “obsessed” about getting that new car, or that new house, or that new gold-diamond-necklace etc., etc., etc. And therefore, people attribute meaning to these things. God, therefore, becomes unnecessary. Tied into this, I also believe that people believe in God the most when they are suffering, in a bad situation. I certainly found this to be the case. On my trip to Russia, the two times I felt best about my Christian faith was when I prayed with Sam Jones on the meeting with the President going well because I was worried some people in the group would say careless things (I consider this worry and anxiety to be suffering). The second time was when I prayed that Sam would recover from his illness (albeit temporarily), allowing him to go to the meeting. When society, or an economic system, or a government, makes life “as nice as possible” for its citizens, I think faith becomes sidelined. Faith thrives in times of difficulty and trouble—so right now Christianity is thriving in China, Latin America (in places of poverty). Why? One reason is because people have nothing else to turn to. After all, the Gospels—Mark’s Gospel in particular—is a very short biography that is all about the suffering of Christ. In fact, one third of the Gospel is dedicated entirely to retelling the story of “The Passion (i.e. suffering) of Christ”. When people are suffering, then they are able to relate to what they hear. I have emphasized the word relate because it is only when you are in a relationship (i.e. a state where you understand the other person) that you are able to be convinced/persuaded of what they believe in. Eleven students of Eton College, the most privileged English school, visited Russia on a personal, non-official tour that included Moscow and St. Petersburg. 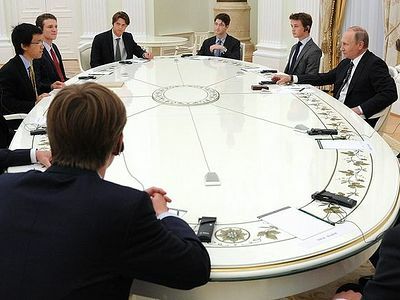 The students became acquainted with their Russian counterparts, and also met with President Vladimir Putin. Bishop Tikhon (Shevkunov) of Egorievsk, Father Superior of Moscow’s Sretensky Monastery, talked with a correspondent of Pravoslavie.ru about how the trip was organized, and gave his impressions of the young British men. May God save him and lead him to the Orthodox Church. This boy is a real treasure! Such profundity, at such a young age! He will surely go far in life.